- When driving, the car will intermittently stall without warning (no lurch, no hard misfire). - After stalling, the engine will crank but will not turn over at all. - Without intervention, the car will only start as normal after waiting a certain amount of time (Usually over 20 minutes). - One "fix" we have found, after an incredible amount of trial and error trying to diagnose the issue, is to disconnect the engine wiring harness from the battery at the connector pictured below and then reconnect it. This allows us to start the car immediately. 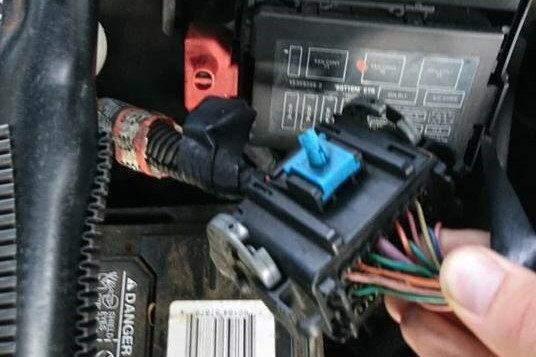 This is the harness connection I toggle that allows me to start the car again without waiting. - Despite 15+ stalls, no codes have been thrown (Or, at the very least, stored). - The car will idle fine indefinitely. - After the car cleared pending codes there has been no check engine light. - The car might make it a mile, it might make it 60 miles. There seems to be no rhyme or reason as to why, when, or where, it stalls. - At no point prior to or after any of the stalls has the notorious security light been observed. - After taking it to a mechanic, who had the car stall on him one time during a test drive, the problem was diagnosed as a bad fuel pump. His reasoning, I believe, is that there was no pressure in the fuel lines. The fuel pump was replaced. Needless to say, this did not fix the issue. I have been told this could possibly have been a false diagnosis related to the passlock. - Failing battery causing alternator to quit. - Summer 2017 - Terrible issues with "power". Car had very poor acceleration, very rough idle. After saving money for repairs, car was taken to local mechanic. - Fall 2017 - Attempt to pick car up. Runs great. Acceleration has returned, rough idle is gone. Except it dies in the mechanic's driveway. Car promptly returned to the mechanic. - Winter 2017 - After stalling during a test drive, mechanic diagnoses problem as a bad fuel pump. - Spring 2018 - Attempt to pick car up again. Car once again stalls in his driveway. After putting over $700.00 in repairs into this vehicle, I am livid. Car is returned to the mechanic, and I demand that he actually fix the problem. - Spring 2018 - I am told the car is fixed, I return from college (over 3 hours away) to pick up car. Mechanic tells me I owe him $30.00 (yeah right). The car makes it out of the driveway this time. I get the car registration renewed (MVA's terrible policies resulted in suspended registration and flags and fees on the vehicle despite no way to even get the car to an emissions station) and legal. - Spring 2018 - Car stalls again, same problem, less than a mile away from my house. I do not return the car to the mechanic this time, because I've lost all faith that he has any idea what he's doing. - Summer 2018 - Begin troubleshooting car with my stepdad, who can only work on it on weekends. Car stalls without warning while driving. There are no security lights, nor any OBDII trouble codes thrown that we can work from despite 15+ occurences of the issue. We determined through trial and error and countless hours that disconnecting and reconnecting the wiring harness allows the car to be started after stalling. This tells us something, but we have no idea what it means. I love my car, and it kills me to see it sitting there gathering dust. Thanks to college, I don't have the disposable income (or, frankly, a sufficient level of trust) to take it to another mechanic. If you guys could help me out I'd be super grateful. Thank you all for your time. 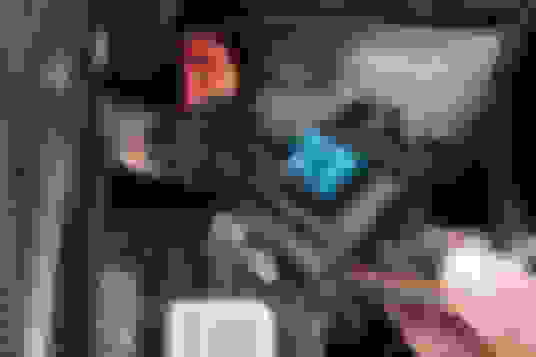 Last edited by Mjhuntt; 08-10-2018 at 06:41 PM. I would start with changing the plugs and wires.. This happened to my bonneville where it was just a random shut off. Just like youre describing, might have made it a half mile, might have ran for a week. Is your air/fuel filters clean? There can be a TON of things that could possibly be faulty AND not throw a code..
but what do you drive? I'm going to assume a 2000-2005 Monte Carlo, probably with the 3800. Check your fuel pressure regulator. Your mechanic thought it was a fueling issue, I am kind of thinking the same. Pull the vacuum line from the FPR on the front of the engine and see if it's wet / smells like fuel. If it is, I would replace. One piece of advice I can offer is with the ignition switch .It obviously is going bad plan on changing it soon. I would also leave the key in it a try not to force it out , if you get the key out and it won't turn back on you will have too drill the lock out to remove it . With the key able to turn like it can now all you have to do is twist the key to remove the switch. I had to drill mine out and its a pain.Good luck. I've updated the original post with some more pertinent information that I didn't include last night. Namely, that the car will idle fine for hours (we've tested up to ~4 hours without any stall). The fuel filter was replaced with the fuel pump. I'm 99% sure that the other filters are all fine, but I'll check when I check the vacuum hose later tonight. Yeah, the breadth of things that could cause this issue is largely why we're having such a hard time. My gut says it's something electronic rather than mechanical, which is why we're able to start it after disconnecting and reconnecting that wiring harness. The difference in behavior, to me, means there's no chance it's coincidental. We're talking having to wait 20 minutes to start it again versus being able to start it instantly if we pop the hood and disconnect and reconnect the engine wiring harness. Apologies, I tagged the post with 6th gen but didnt include the model year in the message body. It's a 2003 Chevy Monte Carlo SS. I'll check the vacuum line later tonight. This is probably where we'll start. Is there any chance that the faulty ignition/ignition switch is triggering the passlock? Do you think there's a component of the ignition switch that would be effected by the engine wiring harness being disconnected and reconnected? If you suspect the MAF, just unplug it. If the problem goes away, there you go. And definitely check that vacuum line. If you think it's a sensor, then I find it odd that it's still intermittent. Another thing that likes to go bad, is the ICM. Those can actually be removed and bench-tested at an auto parts store too. This is the harness connection I toggle that allows me to start the car again after stalling without waiting ~20 minutes. I also added that there's been no check engine light since driving it enough for the pending codes to clear. That's a good idea. The next time I drive it to failure I'll unplug the MAF. I agree with you about it being odd. You would think that if it was sensor failure that it would throw a code. That said, I'm having trouble rationalizing the "fix" with some of the other possible causes. I hate to focus and work backwards like this, but knowing that somehow toggling that connection temporarily fixes the issue is really nagging at me like I'm missing something important. I'm definitely going to get the ICM tested, as those can be super temperature sensitive and present intermittently. I appreciate all the help, guys. Thanks for your time. Keep it coming! Last edited by Mjhuntt; 08-10-2018 at 06:14 PM.